Not surprisingly, the use of fasting for weight loss has a long history, since it’s, kind of, like, obvious. I mean, everybody understands that if you do not eat, you are highly likely to lose weight. Duh. Which makes it even more surprising how much people fear missing even a single meal, let alone fast for a prolonged period of time. They think that fasting (not eating) will make you fat. That’s kind of like saying that splashing water on your head will dry your hair. That’s modern dietetics for you. Kind of a Bizarro world. There are still many doctors who argue that eating sugar is not bad for type 2 diabetics. Kind of makes you wonder how they got into medical school at all. Since it is quite obvious that missing meals leads to weight gain, the old bogeyman, ‘starvation mode’ is often invoked to instill fear. Tales of people ‘ruining’ their metabolism abound. Food companies, of course have eagerly ‘educated’ medical professionals about the dangers of missing meals and the safety of eating sugar. Nobody makes money when you skip meals. Fasting appeared in the medical literature over 1 century ago. Interestingly, they describe ‘professional fasters‘ who would fast for specific periods of time for exhibition. One professional faster went for 30 days and drank a quantity of his own urine. Talk about being starved for entertainment. Kind of like watching paint dry. This was depicted in Franz Kafka’s short story “A Hunger Artist”. 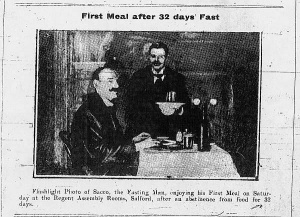 Fasting for entertainment was popular from 1883-1924. My guess is that it really is not that entertaining. In the early 1900s, Drs. Folin and Denis described fasting as ‘a safe, harmless and effective method for reducing weight of those suffering from obesity’. Great. That’s exactly what we need. Something safe, harmless, and effective. The fact that fasting has been performed (mostly for religious purposes) for several thousand years only reinforced the long history of safety. It’s hard to argue that fasting is dangerous if people have been doing for the 5000 years. May as well argue that using soap is dangerous. Yet, myths about the dangers of fasting are everywhere. By the early 1950’s, Dr. W. Bloom reignited interest in fasting as a therapeutic measure mostly using shorter fasting periods. However, many longer periods were also described in the literature. 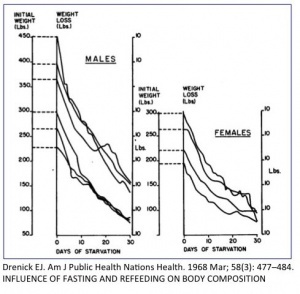 Dr. Gilliland reviewed fasting in the revival of the 1950’s and1960’s and reported his experience with 46 patients “whose reducing regime started with a standard absolute fast for 14 days”. Whoa. I love that. When I tell people to fast for more than 24 hours their eyes just about bug out of their head. These people had a ‘standard’ fast that lasted for 2 weeks! And that was just the beginning! Nothing is further from the truth. There are hundreds of studies spanning over 100 years and clinical experience spanning 5000 years that point to the fact that women and men respond more or less equally except in the underweight situation. This is an easy problem. Should anybody who is seriously underweight, fast? Uh, no. You don’t have to be a genius to figure that out yourself. If you are severely underweight and fast, you could become infertile, yes. Consider the past 2000 years of human history. Are Muslim women ‘exempt’ from fasting? Are Buddhist women ‘exempt’ from fasting. Are Catholic women ‘exempt’ from fasting? So we have millions of person-years of practical experience with women and fasting. And there are no problems in 99.9% of cases. In our own clinic, where we’ve treated close to 1000 patients, I have noticed no significant difference between men and women. If anything, the women tend to do better. Men, it seems, are sometimes just big babies. I will mention here, too, that the highest success rates come when husband and wife do it together. However, pregnant women are, in fact ‘exempt’ from fasting in almost all human religion. As are children. In both situations, this makes entirely logical sense. These people need adequate nutrients for growth, and human populations have always acknowledged this. Let’s be clear here. This point is made that several problems come up with fasting in women. Well, they come up with men and fasting, too. Sometimes women don’t lose weight the way they want. Well, that happens with men, too. The problem of amenorrhea arises when body fat is too low. Yeah, that’s not a problem we treat with fasting. If amenorrhea or any other problems appear during fasting – stop immediately. The women and fasting issue is just another myth designed to discourage fasting. Virtually all case series of the past 100 years have included both men and women. Anyway, back to the study. The patients were hospitalized into a metabolic ward during the first 14 days and only water, tea and coffee were allowed. After that, they were discharged and asked to follow a 600-1000 calorie diet. Funny enough, 2 patients asked(!) to be readmitted for a second 14 day period of fasting because they wanted better results. Did it work? Was there ever any doubt? Average weight loss was 17.2 pounds in 14 days. This is in excess of the roughly 1/2 pound per day of fat loss seen in more prolonged fasting. This indicates that some of the initial early weight loss is water weight. This is confirmed by the rapid regain of weight upon refeeding. It is important to understand this in order to avoid the disappointment that often accompanies the weight gain upon eating again. That quick weight loss and regain is water weight and not a reflection that the fasting ‘failed’. 44 of 46 patients completed the 2 week fasting period. One developed nausea and one simply decided against it and dropped out. That’s a 96% success rate even for a regimen as long as a 2 week fast! This is our clinical experience as well. People always think they cannot do it without ever having tried it a single time. Once we start with fasting, patents in our Intensive Dietary Management (IDM) program quickly realize that it’s actually quite easy. However, after the fasting period, patients were instructed to go on a low calorie diet. This was terribly unsuccessful. 50% of patients did not adhere to this diet over the ensuing 2 year follow up period. Instead of applying successful intermittent techniques, they returned to the unsuccessful constant energy restriction we discussed at the last post. The key point here is that the natural rhythm of life is Feast and Fast. There are times that you should feast (weddings, celebrations), and there are times that you should fast. Intermittent. To constantly restrict calories for years on end is unnatural and ultimately worse, unsuccessful. Ketones appeared in the urine starting on day 2 and persisted throughout the fasting period. All 3 diabetic patients were all off insulin by the end of the 2 weeks. One patient with severe congestive heart failure was able to walk without breathlessness by the end. This 2 week fast was not harmful, as we have been told, but extremely beneficial. Was it hard? In fact, Dr. Gilliland describes a ‘feeling of well being’ and ‘euphoria’. Hungry? Well, no. “We did not encounter complaints of hunger after the first day. We did not meet anorexia.” These experiences were echoed by other researchers of the time. Dr. Drenick, from the VA centre in Los Angeles, also wrote extensively about therapeutic fasting. His experience was published in 1968. 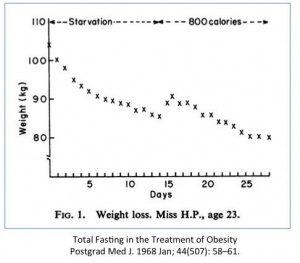 This was a time of renewal of interest in fasting for weight loss. He published his experience of 6 men and 4 women (yes, again there were women in the study). Did it work? In a word, yes. You have a marvellous way of making the complex simple. Hello Dr. Fung. I am trying to follow aversion of your program without being your patient. Fasting no more than 72 hrs and every 24 hrs having a meal. I am having my doctor check my #’s for me every 3 months… My A1c was 6.2 so I want to stop this insanity before it’s to late. I enjoy reading your website here and watching your webinars. Keep up the good work. I am so interesting in this that I started my own fasting group called Fung Shweigh… Thank you again. I love the name, Sandy! So cute! Is it a local group? I often think that we should develop local chapters for fasting. Deb, I follow Dr Fung’s webinars and follow his rules for fasting. I use my own doctor for my blood test. I am on no meds at the time… You can find my support group on Fb .Im in Caif. We help you get thru your short fasting but no more than 72 hrs as you would need a docotrs for that ….we help each other and give support………..
Dr. Fung, could you explain a bit further why initial weight loss is associated with water loss, as well as why weight gain upon refeeding is also associated with water weight gain? Thanks Jennifer for the explanation. When you eat (especially carbs) your liver and muscle glycogen stores are refilled. Glycogen is stored in hydrated form (three to four parts water). A person can store about 400g of glycogen, that’s 1 to 2 kg of water. What’s the Fb name? I couldn’t find it. great idea I also made my own to help other Fung fasters…. if you want to join its Fung Shweigh…. Hi Sonnenblume, When I tried 16:8 with bulletproof coffee for breakfast, I never lost weight. When I went back to regular coffee on the 16:8, weight loss was easier. As long as you eat until you are full and avoid carbs, the number of calories should not matter. Oops, I meant to say I do eat breakfast sometimes. However, it’s rare now for me to eat breakfast. I actually feel better if I do not eat breakfast after my workouts, but I’m only working out three days a week (two aerobics, one lifting weights). Debbie you’ve tried 3 versions of fasting, were any of them more effective weight-loss-wise out of them or was it just a matter of compliance or difficulty that’s the difference ? Dr Fung, what is your opinion of the 5:2 diet where 500kcal is ok during the fasting day? Will it still provide most of the benefits (just a bit less effective) or does that count more as reduced calorie diet? Dr. Fung, Will fasting heal my broken bone in less time? Or should I opt for the high protein diet. Is it possible that weight gain after a fasting period is the body’s way of replenishing some fat stores in preparation for the next famine? Kind of the prehistoric version of saving some money (food) for a rainy day (famine). Have you ever heard of the biologist, Dr. Ray Peat? Some of his theories on fasting have been circulating online, mostly about how fasting raises cortisol levels and is detrimental to our health over the long term. Out of curiosity I found his articles online and read a few on how to balance hormones. Some of his articles are kind of fascinating to read. He doesn’t think sugar causes diabetes, but unsat fats do –?? I know you’re really busy right now, but was wondering if you had any comments about his ideas? My question is, by IF do women stop ovulating? I am torn between trying to cure some of my insulin resistance for the sake of getting to a more normal weight for pregnancy and possibly not being able to get pregnant once I get there. But if you are worried, you can always do a milder version, like 14:10 (3 meals, no snacks) and walk or workout in the morning before you eat anything, taking water only. Such a protocol worked great for me when I was a bit younger!! In this podcast (https://bengreenfieldfitness.com/2017/03/366-float-tanks-strobe-goggles-hacking-vagus-nerve-natural-marathon-fueling-know-youre-recovered-adrenal-fatigue/) Ben Greenfield makes a point that kisspeptin is more suppressed in women who fast and can cause all sorts of hormonal issues for women in prolonged fasts. Any evidence you’ve seen of that? Ive been fasting for six weeks now 16:8 doing exercise in fasted state, I was feeling great, until this last week I started to feel with very low energy and my period started earlier, 1 week sooner than usual. Thats why i ended in this blog trying to find some info for hormonal issues. I’m 35 years old. A weird thing happened to me, I am a woman in my 20s. After doing a four day fast, I noticed my chest size became significantly bigger, (and a little TMI, I felt them getting sore during my fast) kind of amazed at this effect. Don’t know if it’s associated with the growth hormones, I would love to see more studies exploring the various hormonal changes during fasting..
Hi Dani. Any update on your cycle? Did it return again and become more regular again? Thanks. I’m not a doctor, but I have heard that bleeding after menopause is often a sign that something is very wrong. For instance, it can be a sign of ovarian cancer. I would get that checked out IMMEDIATELY. My husband is 82 and very lean. He would like to fast to obtain the other benefits of fasting…autophagy. Would you recommend this?